The first three bands that defined progressive metal for me were Watchtower, Sieges Even and Mekong Delta. We have been waiting now for a quarter decade for the former to finally release its third longplayer, and the second band in my list have become less and less complex and finally split up with a disappointing live record. Se we are left with Mekong Delta who used to be really active from the mid-Eighties to the mid-Nineties, and then went on a decade long hiatus before coming back in 2007 with their comeback album Lurking Fear. Apart from founding member and bass player Ralph Hubert, there were no original members left. Three years later, Mr Hubert once again changed his backing band, and it seems that he is finally satisfied with the line-up, as there haven’t been any other changes since then. Wanderer On The Edge Of Time came in 2010, two years later saw the release of Intersections, in my opinion a rather dispensable compilation of newly recorded versions of old classics (but maybe the band needed this to tighten their live catalogue), and now, I am glad to say, they are back with In A Mirror Darkly, their best album since at least Dances Of Death in 1990. 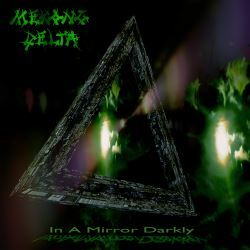 Unlike Wanderer On The Edge Of Time, In A Mirror Darkly does without the numerous interludes that I always thought robbed the album of its momentum. Instead we get seven songs that never run under five minutes but also never quite top the eight minute mark. The current line-up could very well be called an all-star band, with drummer Alex Landenburg’s resume looking like a who-is-who of the metal world, among others melodic metal band Axxis. Vocalist Martin LeMar is also active in progressive metal band Tomorrow’s Eve, and guitarist Erik Adam H. Grösch used to be in the criminally overlooked Annon Vin, and now looks somewhat like a doppelganger of the late Peter Steele. So there is no doubt about the talent involved, and the songwriting, despite the usually long tracks, seems more focused than in the past. It all begins with Introduction & Ouverture, first an acoustic intro played on classical guitar, before turning into an instrumental metal piece. Here is shows once again, had Ralph Hubert been born before the age of electricity, he would certainly have become a classical composer. Past interpretations of many works by Mussorgsky and some by others of course also underline that assumption. The first vocal song The Armageddon Machine sees the full band in prime form: nervous guitar riffs, impressive bass playing, tight complex drumming and a vocalist who really fits in perfectly with the sound of Mekong Delta. I wouldn’t have chosen The Sliver In God’s Eye as the next song, as this ominously symphonic track feels a bit awkward so early on in the album, but it manages to show the band from an unexpected side. Janus is once again a more typical Mekong Delta track where everyone in the line-up shines, but especially the vocals left me breathless with their sense of dramatic display. Inside Of The Outside Of The Inside is another instrumental track, and it speaks for the band that they can pull of all six minutes of it without ever boring the listener. And the title of the track will have your head spinning... it took me a few minutes to finally visualise what they had in mind... or at least I think so. My favourite track is Hindsight Bias, the shortest track on the album and also the catchiest one, if that even makes sense in the case of Mekong Delta. Here the band combines ultra-progressive structures with strangely melodic multi-layered vocals that leave you somewhere between pre-existing aural dimensions. This is how you spell perfection! The album ends with Mutant Messiah, the longest track per se and once again showing Mekong Delta from a side we are so fond of. So I can’t probably declare that Mekong Delta have reinvented themselves, but at the very least they finally found a, hopefully stable, line-up that manages to kindle the passion their very first albums managed to do. There are a few minor complaints, like for instance that it takes the album too long until it gets running full steam, meaning that the two intros are maybe a bit much, and also the aforementioned slower song placed to early on the album, but apart from that, I am more than happy to say that Mekong Delta are finally back and not sounding in the least like a rehashing of old ideas. Let’s hope that the quartet have many more such great albums up their sleeve for future release.